Four Quandrant Control: Simplereversing and braking via a switch closure to the drive. High Continous Current: Up to 120 Amps continuous, robust bus bars used to handle the current. On Board Calibration: Calibrate using on board non-interactive trimmer pots, no programming or additonal accessories are needed. 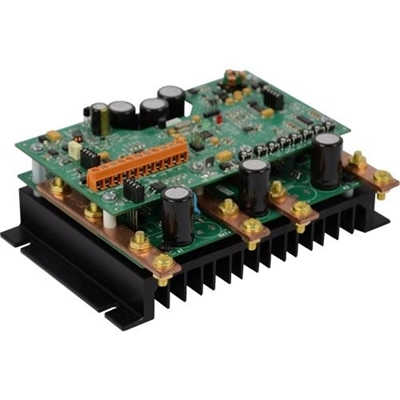 1.01 Form Factor: Clean DC output for effiecient and quiet motor operation at a 16 kHz PWM frequency.